When valuing a new highly energy efficient home, designers, builders, lenders, realtors and homebuyers usually speak in terms of “dollars per square foot” or the “pay back in years on the added costs of energy saving features”. They rarely consider the total cost of ownership of a new home. Yet, the total cost of ownership, not “dollars per square foot”, or “pay back in years” should be the primary financial yardstick used by all stakeholders when valuing energy efficient homes and comparing them to similar standard homes. Here we look at why total cost of ownership is a better way to value a Zero Energy Home. Depending on the energy incentives, rebates and tax credits available in different states, cost-effective Zero Energy Homes (ZEHs) may initially cost from 4% to 8% more to purchase than a comparable standard home. Yet, the total cost of ownership of a ZEH can be considerably less than for a comparable standard home. The total cost of ownership includes monthly mortgage principle and interest, taxes and insurance (PITI), as well as the energy expenses for maintaining and operating a home, such as space heating, cooling, water heating, lighting, appliances, and plugging in all those appliances and electronics! This is now referred to as PITIE (Principle, Interest, Taxes, Insurance and Energy), which better reflects the total cost of ownership. To show why this is so important, I examined the total cost of ownership of two ZEHs in Bend Oregon, which were equivalent to neighboring homes in their size, external appearance, interior finishes, and appliances. The average sales price for these two ZEHs was $420,000. The average added costs to get to net zero (less all available federal and Oregon State tax credits and available energy related incentives) compared to building the same homes without the energy saving features needed to get to net zero, was $12,500, or a 4% increase. The cost of the land, the cost of construction, and the added cost to get to zero were rolled into a 30-year fixed mortgage with a 3.5% APR and a 20% down payment. The monthly mortgage payment for the ZEHs averaged $1,509, and the monthly mortgage payment for the similar standard homes was $1,464, a difference of $45.00 higher per month for the ZEHs. 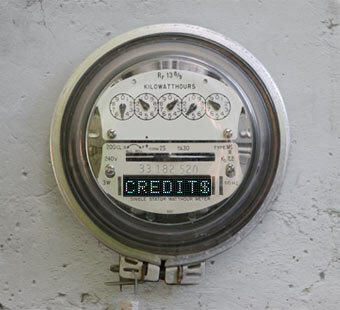 The grid hook-up fee for each ZEH came to $120 for per year, while the yearly electric costs for the comparable standard home were $1920 at 2011 electric prices in Oregon (9.84 cents per kWh). This results in an increased energy cost of $150 per month more for the standard home. Thus the average cost of ownership was $105 ($150 – $45) more per month for the standard home than for the ZEH. So the Zero Energy Home costs less to own than a similar standard home from the very first month. 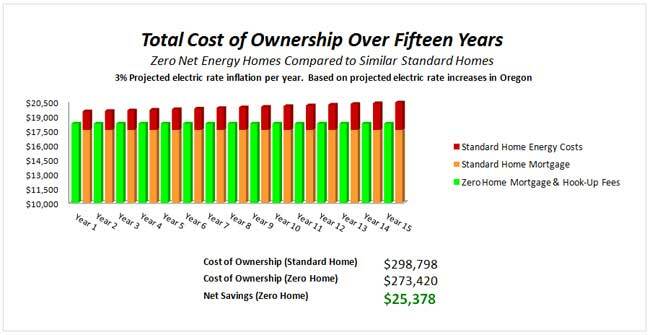 The graph below shows the average total cost of ownership for the two ZEHs compared to a similar standard home over a 15-year period, with electric prices increasing an average of 3% per year. The 3% increase is based on projections for future electric prices in Oregon. The graph shows that ZEHs produce a significant cost savings of $1260 during year one and that the cumulative benefit in energy cost savings for the ZEHs over 15 years was $25,378 @3% inflation. Even though mortgage rates have increased slightly from 2011, the cost of ownership for Zero Energy Homes may be considerably lower in many parts of the country than in Oregon, as electric rates are on the low end in Oregon (currently 10.56 cents per kWh) compared to the average U.S. electric rate (12.56 cents per kWh). Even though mortgage rates, electric rates, and subsidies and incentives vary from state to state, cost-effective ZEH’s will cost less to own in almost all scenarios. The old school of return on investment says you typically need to pay it back in about 6 years or so. With green building it’s a whole different story, and when I explain this to prospective clients they get it, whether they’re a wage earner buying an entry level home or an upper income person buying their second or third luxury move-up product. The return on investment on what you spend for green building is typically realized the first month you’re in the home. Here’s a real example of a 3,00 square-foot home with $300 month average utility bill. If you spend $10,000 additional on the green aspects of the home, you can reduce that energy cost to $150 per month. At today’s mortgage rates, the $10,000 you spend costs you about $30 per month. You’ve saved $150 in utility costs and you’ve spent $30 to do it. Your positive cash flow that first month is $120, and it will be at least $120 a month after that. Whenever I’ve explained that to a customer, whether they’re buying a $100,000 home or $3 million home, they’ve never failed to embrace it and find great value in it. Based on the total cost of ownership, even though the initial square foot costs are somewhat higher, Zero Energy Homes, if built cost-effectively, will cost less to own for the homebuyer than a standard home, starting at year one. Anyone who can afford a home can afford a similar sized cost-effectively built Zero Net Energy Home – a home, which offers so many more benefits than a standard code-built home. Glenn Haupt is the owner of Solar Craft Design located in Bend, Oregon. His work focuses on the design of low energy, healthy green homes. He is a Certified Passive House Design Consultant, Certified Sustainable Building Advisor, Energy Consultant, and blogger.